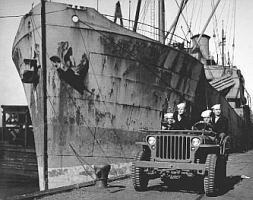 The US Coast Guard remained part of the United States Treasury Department throughout World War II. However, a month before America formally entered the war, President Roosevelt transferred the entire Coast Guard to Navy control. Known as Executive Order 8929, it was signed 1 November 1941. 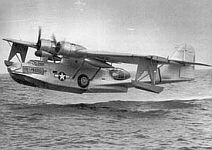 Consolidated PBY-5A / 6A "Catalina"
A majority of the Catalina flying boats operated air/sea rescue. .v The foremost Coast Guard wartime mission was protecting America’s extensive sea frontier and long coastlines, which was primarily accomplished with picket boats and patrol craft assisted by aircraft of the Coast Guard air arm. German submarines menaced this area and the Coast Guard rescued thousands of survivors of torpedoed ships. These rescues were accomplished despite high surf and rip currents, frigid and often storm-tossed Atlantic waves, and the blazing oil fires of stricken freighters and tanker ships. Throughout the war, the Coast Guard continued high-risk chores related to the safety of lives and property at sea. It rescued countless distressed ships, many crippled by enemy action, on the high seas despite dense fog and fierce storms. The expansion of the Coast Guard and release of more men for the front by the women SPARS, and other reserve and auxiliary volunteers, enabled the service to take the fight to the enemy. By June 1945, the Coast Guard operated 802 of its own ships with 24,342 Coast Guard personnel, 288 Navy ships with Coast Guard crews totaling 49,283 personnel, and 262 Army ships with 6,851 Coast Guard crewmembers. These crews included Public Health Service nurses and medical doctors. .v Troops boarding Coast Guard-manned vessels for the invasion of Sicily in July, 1943. The ships ranged from destroyer escorts, Coast Guard cutters, transport ships, cargo ships, attack transport ships and gasoline tanker ships. Others ranged from patrol frigates to landing ships and craft of every type and description. The Coast Guard crack cutter Duane on anti-sub patrol in the North Atlantic. .v The antisubmarine campaign against U-boats, during the great Battle of the Atlantic, was the most important Coast Guard combat task until Germany’s surrender (when emphasis shifted to defeating the Japanese in the Pacific). The Coast Guard relentlessly hunted and attacked enemy submarines around Greenland and the Arctic Circle, the North and South Atlantic Oceans, and in the Mediterranean and Caribbean Seas. 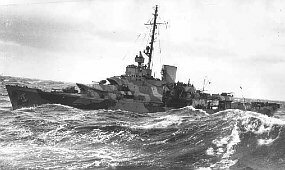 The Coast Guard shepherded convoys with its destroyer escorts and cutters. These were small enough and lightly armed to enable U-boats to fight them on an individual basis. 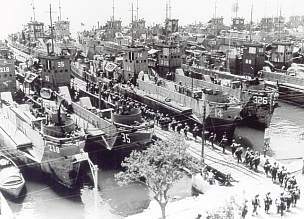 The Coast Guard lost 32 of its ships during this campaign, but sunk twelve U-boats. Eleven German submarines were destroyed by Coast Guard destroyers and cutters, and another was sunk by a Coast Guard aircraft. Disembarking Army troops from the Coast Guard-manned LCVP (Landing Craft, Vehicle and Personnel) of the USS Samuel Chase (Omaha Beach, 6 June 1944) .v The Coast Guardsmen bravely landed Army troops on hostile beaches in North Africa, Sicily, Italy, France and the Pacific despite direct enemy fire that swept the incoming assault boats. At the same time, they also performed daring rescues. 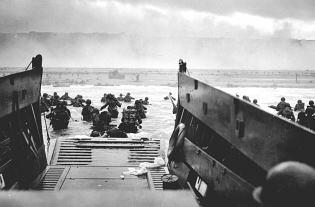 1,660 Army soldiers were saved from drowning by Coast Guard expert swimmers during the invasion of Normandy alone. In these dangerous beach assaults, the small landing craft were often blown apart by enemy cannon, mortars and heavy machineguns, which unfortunately caused high Coast Guard casualties. The US Coast Guard participated in every single amphibious operation conducted by the United States during World War II. The Coast Guard was also responsible for the protection of the American coasts during World War II. The service regrouped its shore stations and lifeboat teams to create the Beach Patrol for this purpose during 1942. .. Right: A Walt Disney cartoon from 1945 featuring Pluto was dedicated to the patrol dogs of the U.S. Coast Guard. It shows Pluto as a member of the Coast Guard who tries to keep a newborn turtle from off-limits beach territory. 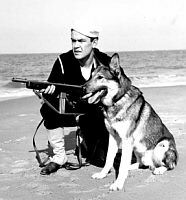 Left: Dog"Sindbad" was the maskot of the Coast Guard. 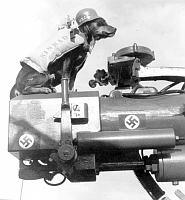 This dog who accompanied the crew of the combat cutter Campbell during the war became quite famous. .. The US Coast Guard in World War II contributed greatly to allied victory. On 1 January 1946, it was returned to the Treasury Department for routine peacetime duty by a grateful nation.